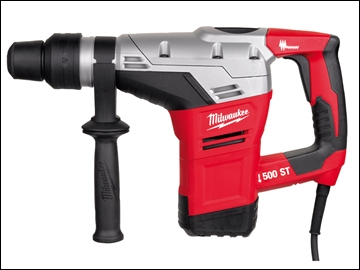 Milwaukee Kango K500ST 5Kg SDS Max Chipping Hammer has the best power to weight ratio in its class, 7.5 Joules and 5.9kg. The powerful 1100 Watt motor ensures maximum power, and maximum durability. Soft start for precise chisel starting, and low vibration construction enhances usage time per day. Fitted with Variolock (12 positions) and a 4 metre cable. Has a robust magnesium gear housing, for tough environments, exact seat fitting of gear components and better cooling. Roto-stop and multi position chisel function allows for 12 different positions to optimise working angles. The safety clutch protects the user and machine from drill bits jam. Has a soft grip main side handle for improved user comfort.